Five bridges over the Charles River are visible in this photograph; in order from front to back, they are the Old Charles River Dam, Lechmere Viaduct, Commuter Rail Bridge, Zakim Bridge, and New Charles River Dam. "Charles River Bridge" redirects here; see below for the historic structures or Charles River Bridge v. Warren Bridge for the lawsuit. 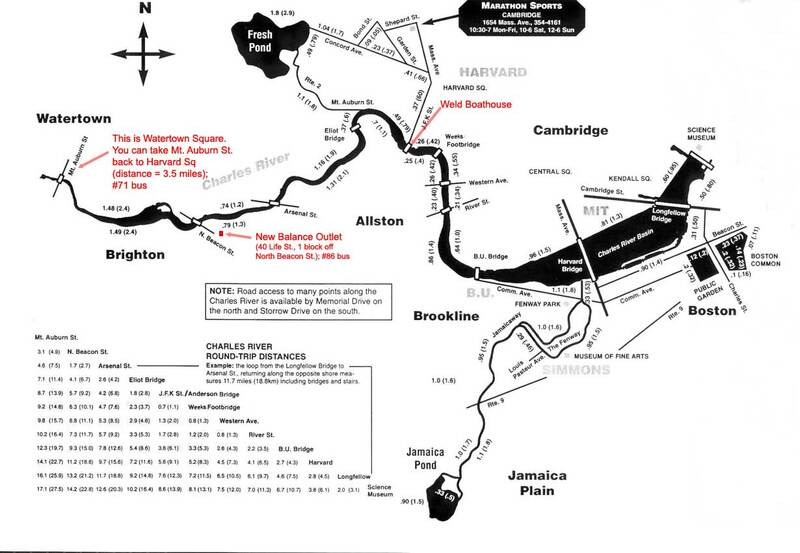 This is a list of the crossings of the Charles River from its mouth at Boston Harbor upstream to its source at Echo Lake (the four tunnels crossing the inner portion of Boston Harbor are not included). All locations are in Massachusetts. Charlestown Bridge Route 99(N. Washington St) Boston to Charlestown 1900 331.9 meters (1,089 ft) The MBTA Orange Line used this bridge, before the upstream tunnel was completed in 1975. (New) Charles River Dam pedestrians and bicycles 1978 Fish ladder, pumps and three locks for navigation. Site of the Warren Bridge, built 1828, demolished 1962. MBTA Red Line 1907 650.7 meters (2,135 ft) MBTA Red Line in median; built in 1907 as the Cambridge Bridge, renamed for Henry Wadsworth Longfellow in 1927. ^ a b c d e f g h i j k l m n o p q r s t u v w x y z aa ab ac ad ae af ag ah ai aj ak al am an ao ap aq ar as at au av aw ax ay az ba bb Massachusetts Bridges Spanning the Charles River. Massachusetts Department of Transportation (MassDoT). ^ "Some Events Around Boston". Kellscraft.com. Retrieved April 16, 2012. ^ "HISTORIC AMERICAN ENGINEERING RECORD - Boston & Maine Railroad: Charles River Bridges - MA-22". Retrieved March 4, 2014. ^ "Publications - Cambridge Historical Society (Mass.) - Google Books". Books.google.com. Retrieved April 16, 2012. ^ Paige, Lucius Robinson (1877). History of Cambridge, Massachusetts, 1630–1877: With a Genealogical Register. Hurd and Houghton. p. 195. Retrieved August 4, 2008. ^ "DCR Recreational Advisory: Joseph Thompson Pedestrian Bridge in Watertown". ^ "The Bemis Dam: A forgotten Link to Our Industrial Past". Historic Newton. City of Newton. Retrieved June 16, 2014. ^ "Newton Lower Falls bridge". Newton Bicycle/Pedestrian Task Force. July 31, 2012. Retrieved June 16, 2014. ^ a b "Mary Hunnewell Fyffe Footbridge". Newton Conservators. Retrieved June 16, 2014. ^ "DeSorgher: Cross That Bridge When You Get to It". Medfield, MA Patch. January 6, 2012. Retrieved July 11, 2018. Wikimedia Commons has media related to Bridges over the Charles River. This page was last edited on 12 March 2019, at 19:42 (UTC).